East Wansdyke at Milk Hill (click here to enlarge), looking west to Tan Hill. Wansdyke is running across the southern escarpment of the Marlborough Downs, with the Vale of Pewsey in the background. East Wansdyke at Milk Hill (click here to enlarge), looking east to West Woods and Savernake Forest. Clearly visible is Red Shore, where the ancient Ridgeway passes through Wansdyke, with the modern road beyond. 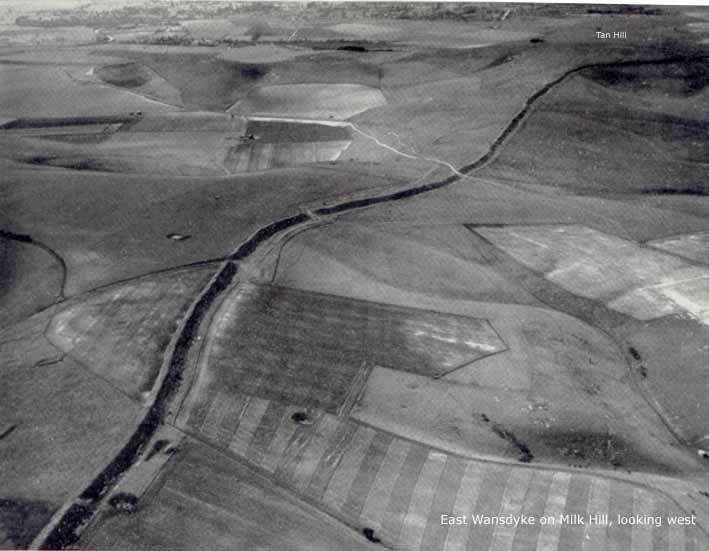 Wansdyke was mentioned by name (Wodnes Dic) in three Anglo-Saxon charters recording royal grants of land in Stanton St. Bernard to Ordlaf (AD 905) and the Bishop of Ramsbury (AD 957 and 960). From the shoulder of Milk Hill, Wansdyke passes north of two more ancient features mention in these charters, Oxna mere (a pond) and Eald Burh (the 'Old Castle'). An older charter of the ninth century, mentioning Wansdyke along the Alton Priors  Alton Barnes boundary, referred to thaere Ealdan Dic (the 'Old Ditch'). This spread (click here to enlarge), shows East Wansdyke on Milk Hill, with the view north to the Kenneth Valley during my visit in 1996. Directly north are Sillbury Hill and Avebury Stone Circle. At this point, the soil changes, and Wansdyke is tree-covered for the remainder of its course through arable downland up to Savernake forest. 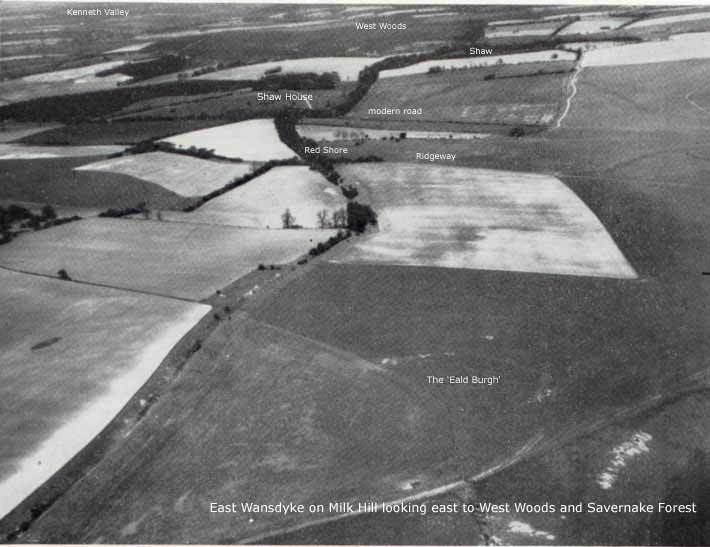 This spread (click here to enlarge), shows East Wansdyke on Milk Hill, looking east and from left to right to the Kenneth Valley across the West Woods to the Vale of Pewsey, 1996. This rotating panorama, shot by Pete Glastonbury, also shows East Wansdyke on Milk Hill, looking east and from left to right to the Kenneth Valley across the West Woods to the Vale of Pewsey, 2002. 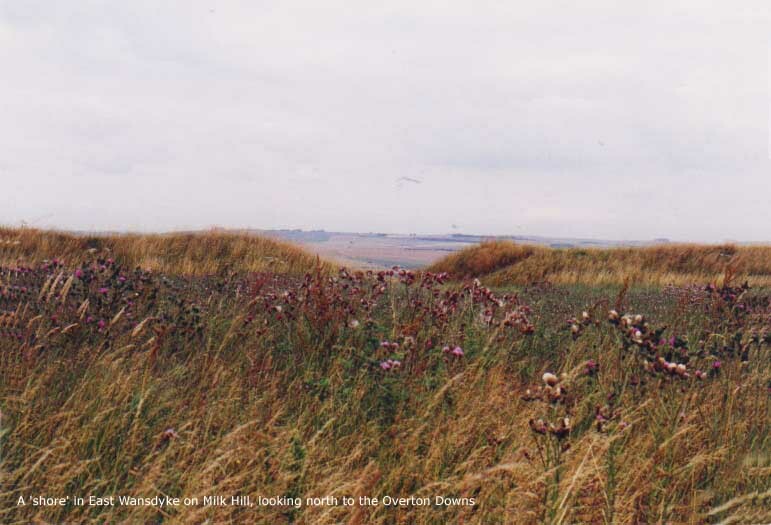 At Red Shore, thus called for the red soil, Wansdyke is crossed by the ancient Ridgeway. This is now a drove-road (where cattle was driven across from the farms to the markets or from pasture to pasture), but in early times it was a long-distance route from the Dorset coast to the Norfolk coast, maybe even as far back as prehistoric times down to the end of the Middle Ages. The above ninth-century charter mentioned it as thaet Riad Geat (The Red Gate), now called Red Shore. 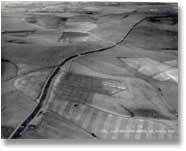 Today, the Ridgeway Long Distance Path still uses this ancient site, which is unfortunately densely overgrown, as can be clearly seen from the 1956 airshot above right. Thonon on otherne Micelne Stan on tham Wege middan on thaere DaeneBythan the ligeth ut on Woddes Geat. A great stone lying on the track in the middle of the bottom of the dene that runs to 'Wodens gate'. Given the name of a great tumulus nearby (Wodnes Beorge/Wodens Barrow), Wansdyke crossing this valley called Wodens Dene, it seems fair to assume that Wodens Gate was the gap in Wansdyke where the road ran through. According to Fox & Fox, the boulder was therefore to be found along the modern road, where they thought to place Wodens Gate. 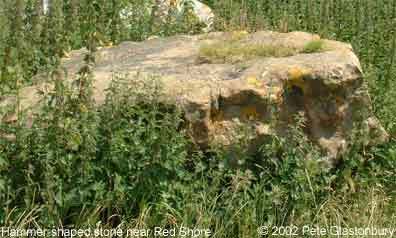 However, this rock, measuring 3x6x2 ft., is surely placed where the Ridgeway crosses Wansdyke at Red Shore (as reported by Burrow)! Therefore, either Red Shore may be a better candidate for Wodens Gate thyan the modern road passing near Shaw House, or we must look even further south, the point where all roads meat and descend the southern escarpment. Hammer-shaped stone, found where the Ridgeway crosses Wansdyke. The picture was drawn in 1925. Wansdyke, now overgrown for the remainder of its track to savernake Forest, passes Shaw House, where it diminishes greatly in size. Directions to Section 9 can be found here.